The crack of a gunshot rang out, then another. Both came from across the valley where I was picking olives with Palestinian farmers, one of 30 British volunteers working in small groups as protective presence. The reason for the shot? The constant aggression from Israeli occupiers endured by the West Bank (Palestinian occupied territory) peaks during the harvest, the high point of the year for Palestinians. 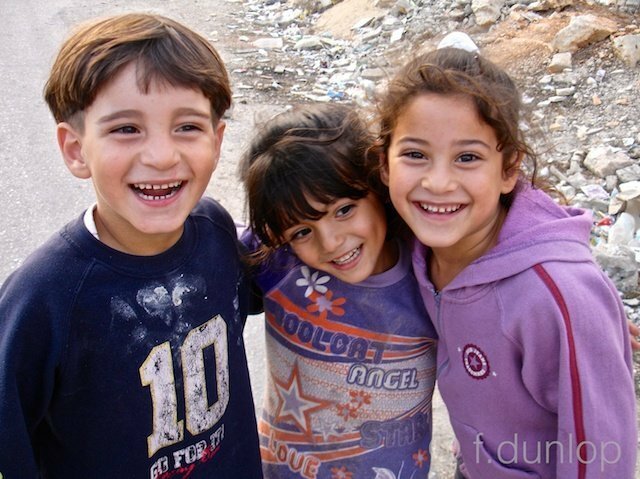 I’ve volunteered before and written blogs about aspects of the experience here and here (for other posts, enter Palestine in the search box on my home page). But this year proved to be very different. Immediately after the shots, plumes of smoke billowed across the hillside opposite, soon becoming a wall of flames as fire ravaged the groves. Settlers. The word ‘settler’ may sound innocuous, indeed rather pacific. Far from it. In the West Bank it refers to a category of Israelis who, subsidised by their government, are slowly eating up more and more of Palestinian land. There are now estimated to be over half a million ‘settlers’ living in ever-expanding hilltop townships deemed illegal by international law. Yet their inhabitants live with impunity and by continual harassment of neighbouring Palestinians hope to gain even more land and become the sole occupiers. 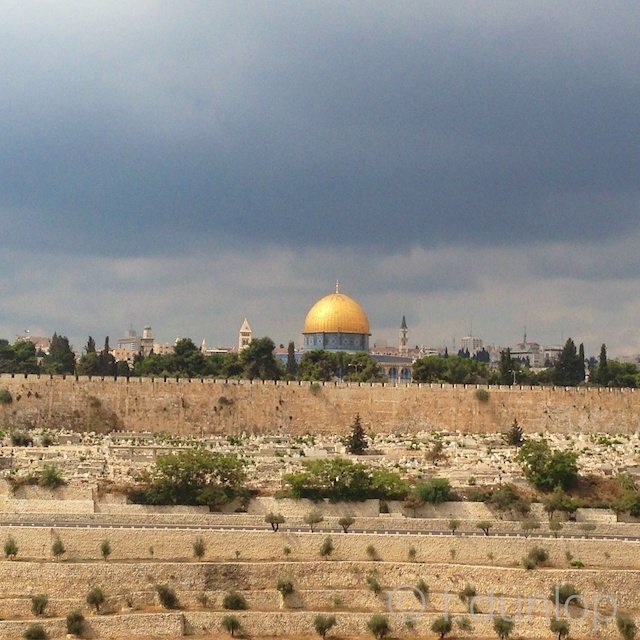 Some background to the 2015 conflict: On October 1st, violence and killings kicked off in occupied Palestine as a result of Israel’s expanding control of Temple Mount / Haram esh-Sharif, in East Jerusalem. This is where the golden Dome of the Rock, an iconic Islamic shrine rebuilt 1000 years ago, glitters magnificently across the esplanade from the 8th century Al-Aqsa mosque, considered Islam’s third holiest site. As such, it was a rash move by Israel to tinker with the access policies which it controls, and even more misguided to allow hardline extremist settlers into the mosque compound. Red rag to a bull…even if for the Jewish community Temple Mount is traditionally the sacred site of Solomon’s temple, giving them grounds for demanding equal access. Outrage, shootings (including the murder of a settler and his wife in their car) and deadly knife attacks exploded, prompting trigger-happy young Israeli soldiers to respond with lethal bullets. In fact the day after I arrived, as I walked along the ramparts above the Old City to soak up its atmosphere and beauty, a Palestinian was shot at Damascus Gate, within sight of my walking route. Today, four weeks later, the death toll is still rising*: Israeli forces or settlers have killed 66 Palestinians including unarmed protesters (mainly students), bystanders and alleged attackers. Nine Israelis have been killed by Palestinians in stabbing or shooting incidents, and one was killed by his own people, mistaken for a Palestinian. 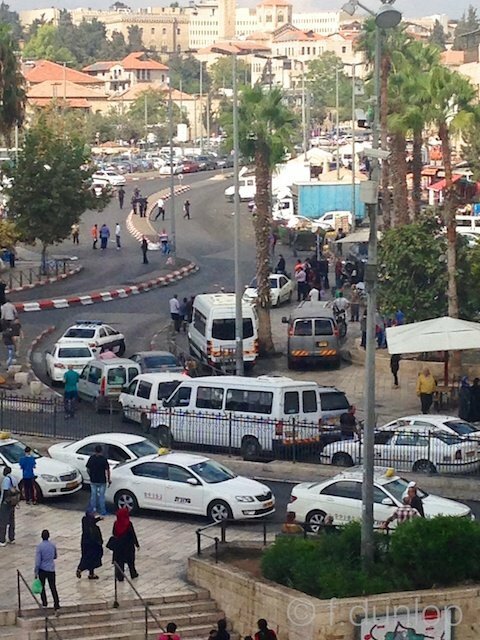 Some call it the Third Intifada. For me, it’s more like a distillation of a 67-year struggle against occupation, humiliation, intimidation and a daily grinding down of the soul. But back to the olive groves. 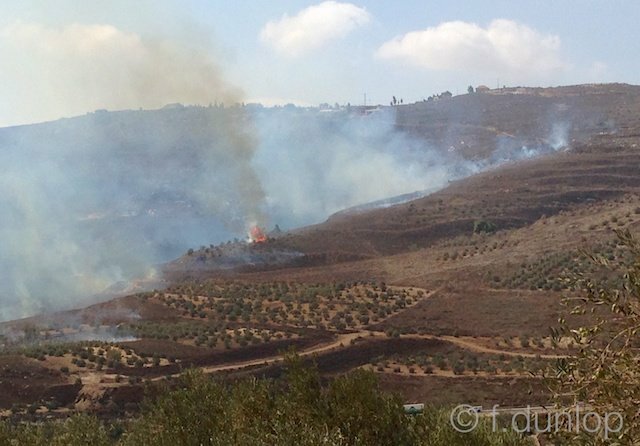 As we watched the smoke rise from the hillside, I had no idea that one of my fellow volunteers, David Amos, had been viciously assaulted by settlers, resulting in his hospitalisation and five stitches to his head. The incident was fully reported in The Independent and photos of his bloodied face went viral. What had happened was that a large group of masked settlers from the extremist settlement of Yitzhar had attacked him, two British women and a Palestinian farmer. Flinging rocks at them, the settlers charged down the hillside, yelling at them to leave. Their alleged crime? 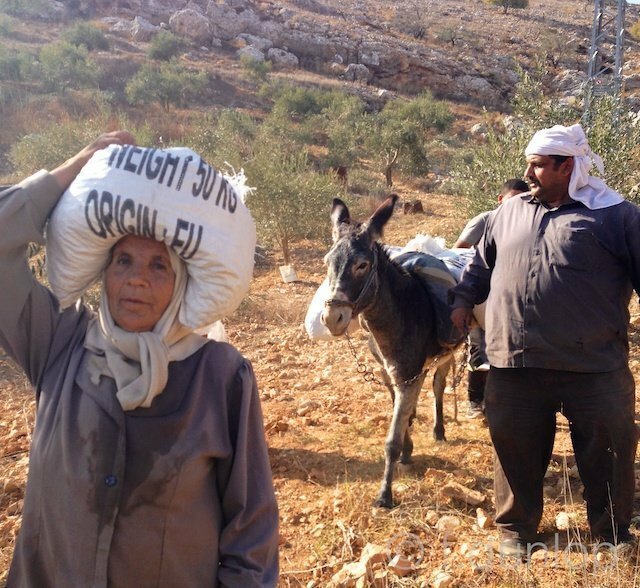 Picking olives on the Palestinian farmer’s land close to the settlement. In the assault, the settlers snatched a camera, a bag and a couple of mobile phones. 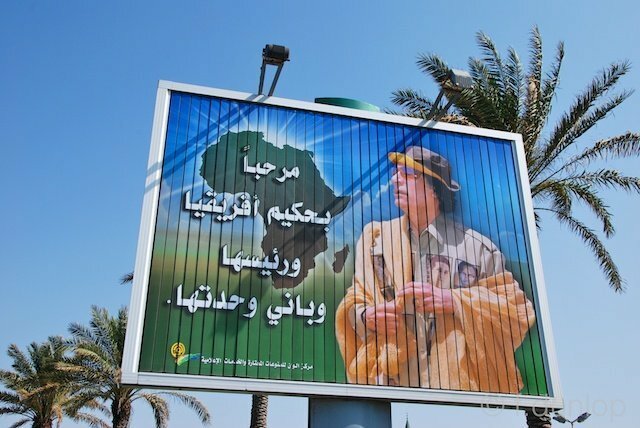 There’s nothing new about this, farmers are regularly targeted, and their groves set alight or axed, but the fact that this time internationals were also victims brought the attention of the world media. 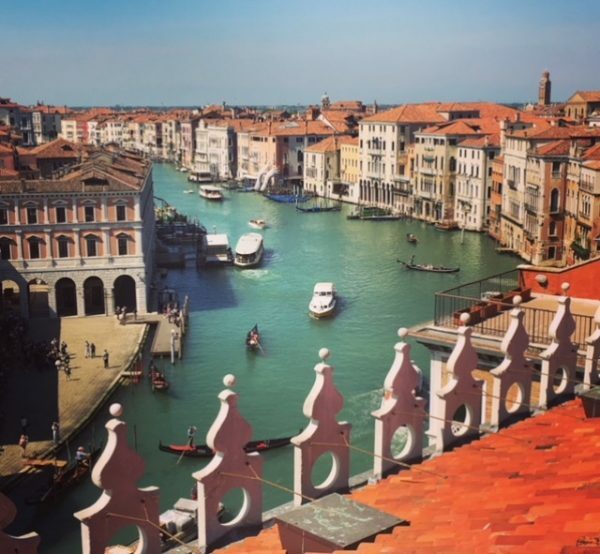 Our main base was Burin, a once beautiful village of limestone houses, spiked with cypress trees, splashes of leafy fig-trees, pomegranate trees and curtains of crimson bougainvillea. It straddles a terraced valley about 10 km southwest of Nablus, capital of the West Bank’s olive oil economy. Today some of Burin’s houses are semi-ruined, their owners long gone, and rubbish lingers like confetti everywhere (priorities are elsewhere), yet there are also smart new houses and cars, and this year even a couple of new grocery shops. One was run by a woman whose husband was in prison in Israel, therefore inspiring sympathy, though I remained faithful to a family shop where the eldest son spoke excellent English and could quote Hamlet. A bright, affable graduate in English lit, he had no option but to work in the shop. At least he had a job – of sorts. Unemployment in the West Bank is about 20%, particularly high among young men and in the agricultural sector, much thanks to the endless hurdles created by the Israeli government and army. However Burin’s secret weapon is its two mosques, as the muezzin are particularly melodious and you might say long-winded, their calls to prayer echoing across the valley five times a day. It’s a moving sound for sympathisers. 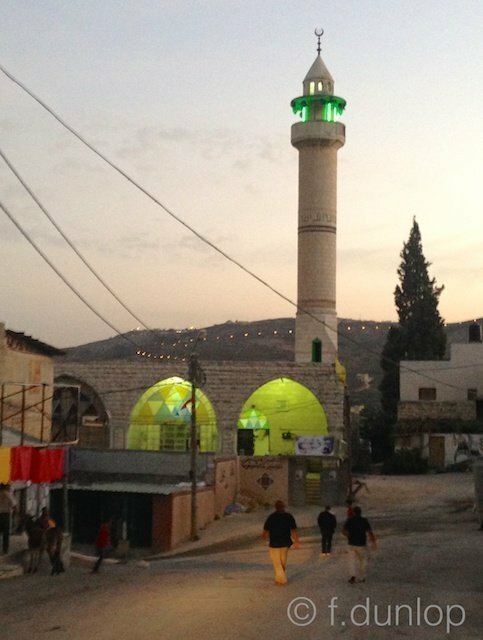 Above is the central mosque at dusk, with the lights of Yitzhar on the hillside behind. Every night, apart from the muezzin, we would be woken by frantic barking from the village guard-dogs, usually around 2 – 3 a.m. Next morning our neighbours would tell us that, yes, the Israeli army had been in the village again, sometimes raiding houses to make an arrest, sometimes patrolling in an aggressive show of strength. Some families were left in shock as sons were led away to be interrogated and imprisoned – often for no reason, at the most throwing stones. Inevitably some of these young men are turned, and come back as informers, adding yet another weight to village existence – who to trust? One day, at the school on the edge of the village, some of my fellow volunteers watched, appalled, as soldiers behind the perimeter fence idly pointed their guns at children playing in morning break. A joke? No, this is all part of life in the occupied West Bank, where traumatised kids wet their beds and others are beyond discipline. That’s surely lesson no. 1 in how to create protest and ‘martyrs’. Yet resilience and spirit still dominate – as above. Later we decided the stench might have been skunk spray, a noxious substance as offensive as sewage though a lot easier to apply. A few students and soldiers still hung around after their skirmish, but it was on our return late in the afternoon that the battle changed gear. 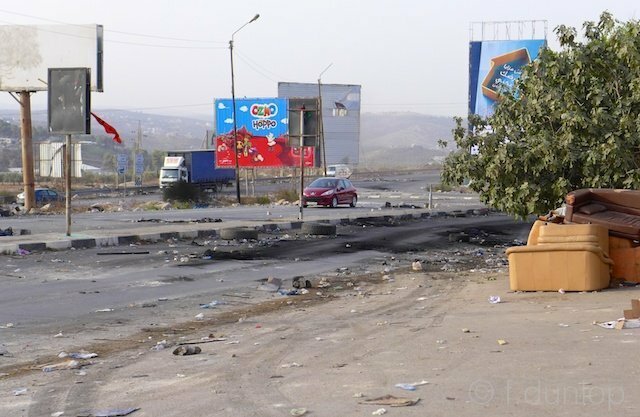 By now 20 – 30 students, keffiyehs tied round their faces, were lobbing stones or aiming catapults at fully armed soldiers from an army said to be no. 6 in the world. David & Goliath? Justifiably mistaking us for settlers, the enraged young Palestinians even threatened us (four women) – making it momentarily pretty scary, until the farmer’s son put them right. During the day, we had picked high up on what should have been an idyllic hillside with Suleyman, his father, Omar, his rather dotty mother (who dished up an ace picnic lunch) and an obstreperous donkey. An army helicopter circled noisily and repeatedly overhead, no doubt monitoring events (and us), and a string of army jeeps were parked down below. 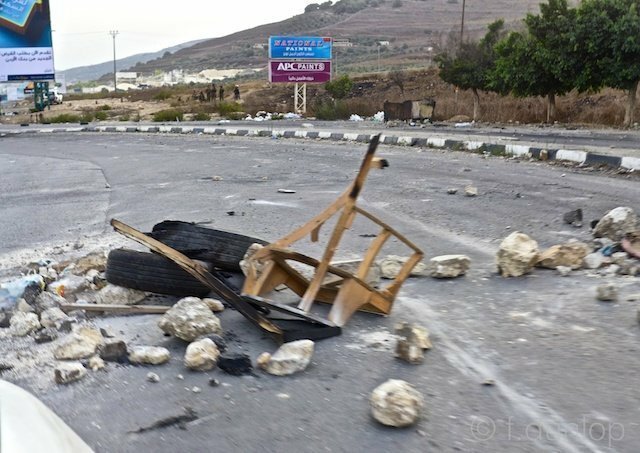 They were protecting the access road to Bracha, another extremist orthodox settlement like Yitzhar that crowns the opposite hilltop, sandwiching Burin in the valley between. 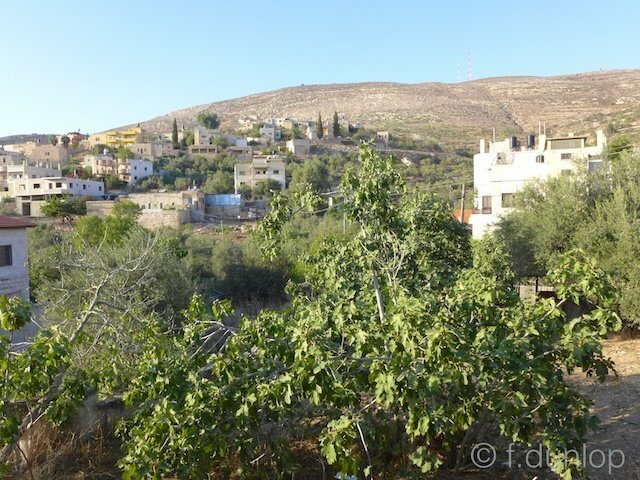 Suleyman’s groves lay just below Bracha, in fact we could see a couple of buildings on the brow of the hill, so he wanted to get them harvested fast. Here he is below, with his mother carrying a sack of olives. Impromptu checkpoints hardly helped their home lifestyle either, sometimes cutting off the village entirely and forcing some people to spend the night with friends elsewhere. One young villager told us how soldiers at a checkpoint had once made a friend of his strip to his underpants – in winter, with snow on the ground. Both were forced to abandon their car and walk home. Intense humiliation. We witnessed tragedy in a Burin household too. One day a neighbour told us sadly that her 19-year old cousin had just been shot dead in a student protest (the Israeli army has graduated to live bullets), while her son showed us footage on his phone of his cousin’s last moments at Nablus hospital. This is a common though unexpected reaction, the sharing of death scenes on a mobile phone in a strangely detached, emotionless way. How many times have they seen those last breaths? So the psychological toll continues. 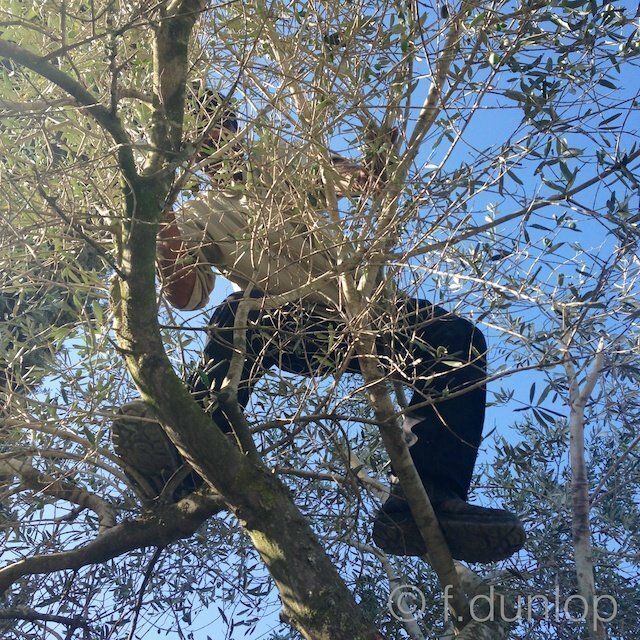 On my last day we were helping a different farmer in what appeared to be a relatively safe olive grove on the edge of the village. Clusters of fat green olives dripped in abundance from the healthy trees, filling up the sacks satisfyingly fast. 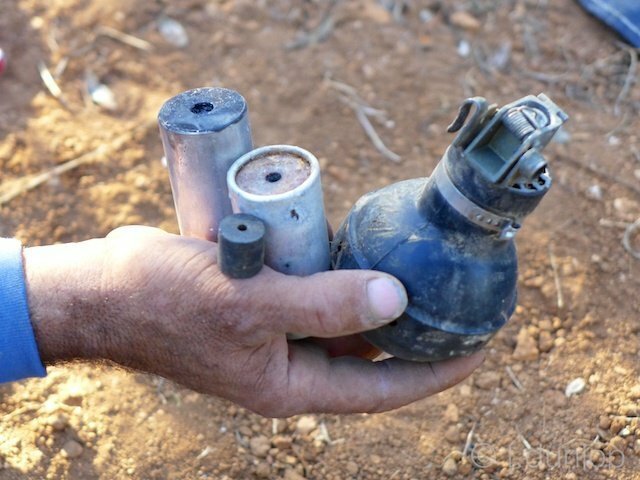 Then, during one of many coffee breaks, Akram showed us what he’d gathered from this grove where he had been attacked a few weeks earlier: a rubber bullet, ‘normal’ gas canisters and one like a grenade that, he explained, fizzes as it hops…. 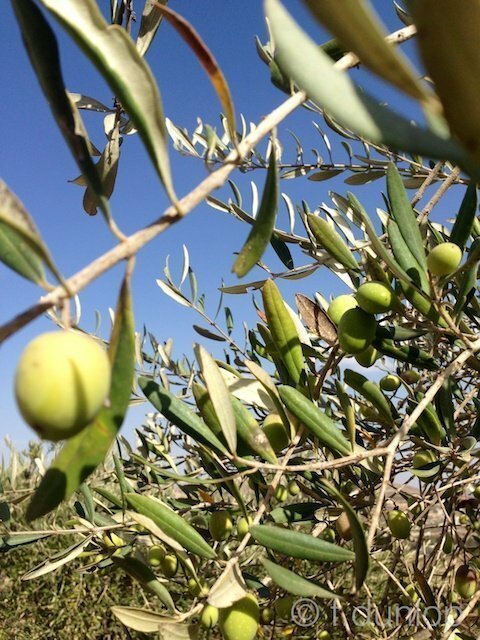 That’s life, and sometimes death, in the West Bank, amongst the olive-trees. The plan to drive the Palestinian villagers from their homes, deprive them of income and destroy the landscape is in full swing. This is a crime. 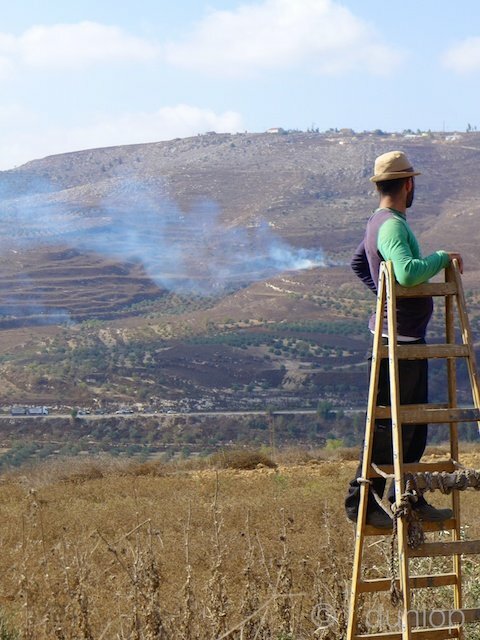 A well documented account of our recent, protective presence at this year's olive harvest in and around Burin, where the violations of day to day life under military occupation and the activities from the ever expanding illegal Jewish settlements continue to exact their toll on a people we have come to know and love and who just want to get on with their lives. Yes, life could be so simple...but it isn't. Israel gets over $3 billion of US military aid which, with Egypt's $1.3, accounts for 75% of all US foreign military aid. And that's not likely to change. Obama has done nothing. Great to be with you Bev!